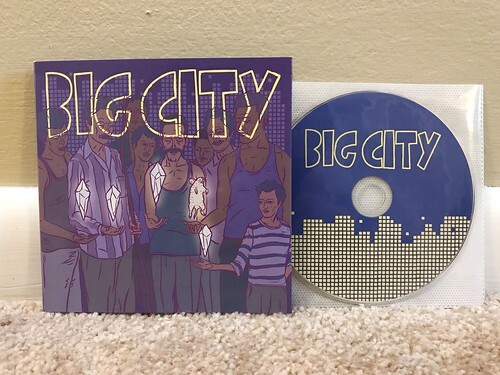 Following up on the Big City EP that I wrote about yesterday, this self titled CD is the first full length release from the band. They build off of the early promise of that EP and in almost every way exceed expectations. This album is a big leap forward in songwriting and production, while still hanging on to the passion and energy that made the EP so thoroughly enjoyable. The first thing I notice about the songs on this album is the increased fidelity of the production. Everything sounds a little more polished and the songs themselves are just a touch slower. Often times this is where bands start to lose the charm that made them fun to listen to in the first place, but for Big City it is exactly what the band needed. Like their first EP, you can hear the connection to bands like The Urchin and Dillinger Four. That said, this time out there are more melodic tendencies. I hear similarities to bands like RVIVR and Iron Chic, especially when it comes to the choruses and backing vocals. There's a definite increase in anthemic singalongs. But the way they combine this with the faster paced, driving energy that's more in tune with the Japanese scene they call home, the end result is a mix unique to Big City. Him Kerosene - Loser Outfit 7"
Part-Time Lover - Kelly Cruise Kelly 7"